Most of the survey respondents in Japan (32.5%, notably above the 23% in Asia Pacific) consider cost containment to be the biggest challenge to business profitability this year. Nearly 79% of survey respondents in Japan offered trade credit terms to their B2B customers over the past year. This response rate, which is in line with that observed in Australia, is significantly below that of Asia Pacific (91%). This finding shows that Japanese respondents, like those in Australia, are notably more inclined to request payment on cash, cash equivalents or on terms other than trade credit from their B2B customers, than their peers in Asia Pacific are. A breakdown by percentages indicates that Japanese respondents are, on average, more likely to sell on credit terms domestically than internationally. This inconsistent perception of payment default risks arising from domestic and foreign B2B trade is common across almost all of the countries surveyed in Asia Pacific, with the exception of Australia. Domestically, B2B credit-based sales in Japan average 60.4% of the total value of B2B sales in the country. This percentage falls to 52.7% in respect to foreign B2B sales made on credit. Both averages are notably above those for Asia Pacific (50.6% domestic and 42.5% foreign), and are also the highest in the region. 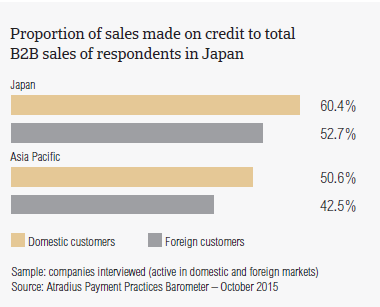 Although fewer respondents in Japan than in Asia Pacific overall offer trade credit terms to B2B customers, the value of the sales made using trade credit in Japan is the highest in the region. Over the past year, the average proportion of domestic B2B sales made on credit in Japan remained unchanged. This is in contrast to the average 3.2 percentage point increase recorded in Asia Pacific. Foreign B2B sales on credit, conversely, increased by an average of 16 percentage points. This is three times higher than the average percentage point increase observed in the region. Moreover, this suggests that, on average, Japanese respondents offer trade credit more liberally than respondents from other countries surveyed in Asia Pacific. Domestic B2B customers of survey respondents in Japan are given an average of 47 days from the invoice date to pay for their purchases on credit. 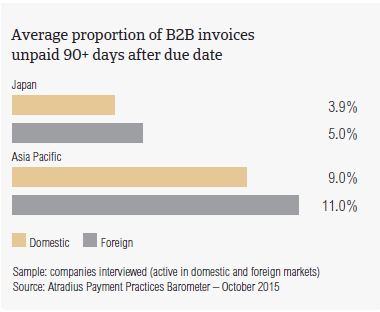 Almost the same payment term (an average of 43 days) is given to foreign B2B customers to pay invoices. Both terms are significantly above the 33 days average for Asia Pacific overall, and are the most relaxed payment terms observed in the region. Compared to the same survey period one year ago, domestic and foreign average payment terms in Japan decreased by an average of two days and five days respectively. In contrast, at regional level, the average payment terms for domestic and foreign invoices remained stable. Over the past year, survey respondents in Japan experienced late payment of B2B invoices markedly less often than most of their peers in Asia Pacific (63.2% of respondents in the country, compared to 90.2% at regional level). The overdue invoices figure for Japan is the lowest in Asia Pacific. 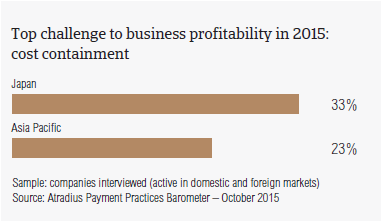 Late payment from B2B customers abroad was experienced more often than from domestic customers. This corresponds to an average of 24.8% and 28.7% of the total value of domestic and foreign B2B invoices respectively, which remained outstanding at the due date. Both averages are well below those of the region (44.8% domestic and 45.2% foreign), and are the lowest in Asia Pacific. The various reasons for customers’ slow payment will be commented on further in this report (see below ‘Key payment delay factors”’). Receivables which remained unpaid 90 days or more past the due date averaged 5% of the total value of Japanese respondents’ B2B invoices. This rate is half the average of Asia Pacific. The proportion of long outstanding receivables from foreign B2B customers is higher than that from domestic customers. This is in line with the survey pattern. Respondents in Japan posted an average DSO figure of 40 days, which is in line with that of Singapore and Taiwan. The average Japanese DSO is higher than the 35 days average for Asia Pacific, and is the longest in the region. This finding is consistent with the long payment terms offered to B2B customers by Japanese respondents, and the levels of overdue invoices observed in the country. Most notably, the above finding suggests that a larger percentage of high value invoices of businesses surveyed in Japan, and in general in countries with an above average DSO, are paid slower. The longer invoices remain unpaid the less likely they are to be paid, potentially exposing the seller to losses. Domestic B2B customers of respondents in Japan settle their past due payments, on average, 13 days after the due date. A slightly longer delay is taken by B2B customers abroad; foreign overdue invoices are paid within an average of 16 days past due. These payment delays are lower than the regional average (25 days domestic and 28 days foreign). According to this finding, B2B suppliers in Japan receive payment on past due domestic and foreign B2B invoices, on average, around two months after invoicing. Over the past year, the average domestic and foreign payment delays in Japan decreased notably. This means that businesses interviewed in Japan receive payment on overdue invoices, on average, two weeks earlier than in 2014. Despite the faster payments, the average DSO of Japanese respondents suggests a large portion of B2B receivables remain unpaid for a significant time. This implies high costs from an administrative and financial standpoint. Additionally, this may explain why most of the respondents in Japan (32.5%, versus 23% in Asia Pacific) consider cost containment to be the biggest challenge to business profitability this year. Respondents from Japan and Taiwan appear to be the most concerned about this. Notably above the regional average is the percentage of Japanese respondents (25.4% versus 17.4% in Asia Pacific) who consider a likely fall in demand for their products and services to be the biggest challenge to their company’s profitability this year. 29.3% of respondents in Japan (versus 24% in Asia Pacific) said that late payments from domestic B2B customers occurred most often due to disputes over goods delivered or services provided, which didn’t correspond to contractual terms.. The second most often reported reason for late payments involving domestic B2B customers in Japan is the complexity of the payment procedure (24.1% of respondents, versus 28.6% in the region). One in five respondents reported that payment on domestic B2B invoices is received late due to the formal insolvency of the buyer (respondents in Asia Pacific: 21.4%), and because outstanding receivables are used as an alternative source of short-term financing (respondents in Asia Pacific: 29.6%). The complexity of the payment procedure is also the most often cited reason for late payment from customers abroad (36.7% of respondents in Japan, compared to 39.4% in Asia Pacific). Nearly one in four respondents in the country (versus 28.3% in the region) reported that foreign customers paid invoices late most often due to disputes over the quality of goods or services provided. One in five respondents (versus 34.5% in Asia Pacific) said that foreign B2B customers pay invoices late most often due to liquidity issues. In Japan, the proportion of B2B receivables written off by respondents as uncollectable averages 1.0% of the total value of B2B sales on credit. This is half the survey average. Consistent with the survey pattern, domestic write-offs outweigh foreign ones. This is likely to be due to the different law systems, business and trade norms on foreign markets, which can significantly hinder collections efforts. Uncollectable Domestic and foreign B2B receivables were reported to chiefly stem from the chemicals, construction, consumer durables, electronics, food, machines and services sectors. For most of the respondents in Japan (63.7%), B2B receivables went uncollected because the customer went bankrupt or out of business (respondents in Asia Pacific: 54.4%). Nearly one in four reported that receivables were written off as uncollectable as the customer could no longer be located (35.5% of respondents in the region). One in five respondents said that receivables were written off due to the failure of the collection attempts (38.6% of respondents in Asia Pacific) or because the debt was too old (32.6% of respondents in Asia Pacific). Survey respondents in Japan reported having granted trade credit mainly to B2B customers belonging to the chemicals, construction, construction materials, consumer durables, electronics, food, metals and services (business services, and services in general) sectors. The longest payment terms, averaging 48 days from the invoice date, were given to domestic customers in the electronics sector and to foreign B2B customers in the machines sector. Domestically, B2B customers in the consumer durables sector generate the highest levels of late paid invoices (around 30% of the total value of B2B invoices was classified as overdue). Internationally, it is the business services sector that generates the highest level of overdue payments (40% of B2B invoices ended up in late payment). The highest percentage of respondents in Japan (two in five), said that domestic B2B customers in the consumer durables and electronics sectors delay invoice payment most often because the goods delivered or services provided do not correspond to what was agreed upon in the contract. Foreign B2B customers in the chemicals sector delay invoice payment most often due to the complexity of the payment procedure (three in four respondents). Seven in nine respondents in Japan do not expect any significant change in the payment behaviour of their domestic customers over the coming 12 months. Around 10% anticipate a worsening, most likely in the construction sector. Almost the same percentage of respondents expect an improvement, chiefly in the machines sector. Nearly three in four Japanese respondents anticipate no change in foreign customers’ payment behaviour over the coming 12 months. Fewer than 10% anticipate a deterioration, particularly in the construction and business services sectors. One in five respondents expect an improvement, most probably to occur in the consumer durables and machines sectors.